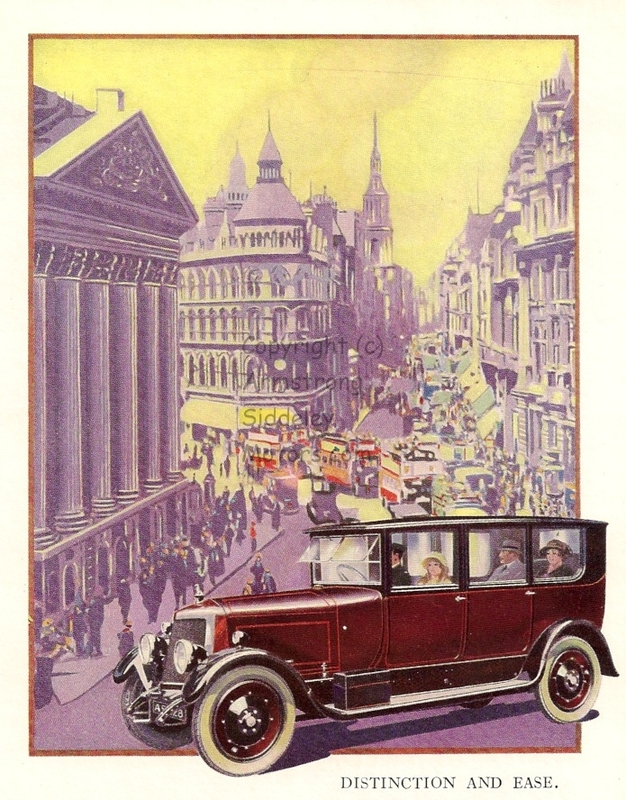 In 1924 Armstrong Siddeley Motors published Making a Modern Car written by E P Leigh-Bennett. This included an effusive description of the factory at Parkside in Coventry where Armstrong Siddeley made cars and aeroplane engines and Burlington manufactured most of the bodies on the cars. This is an extract. 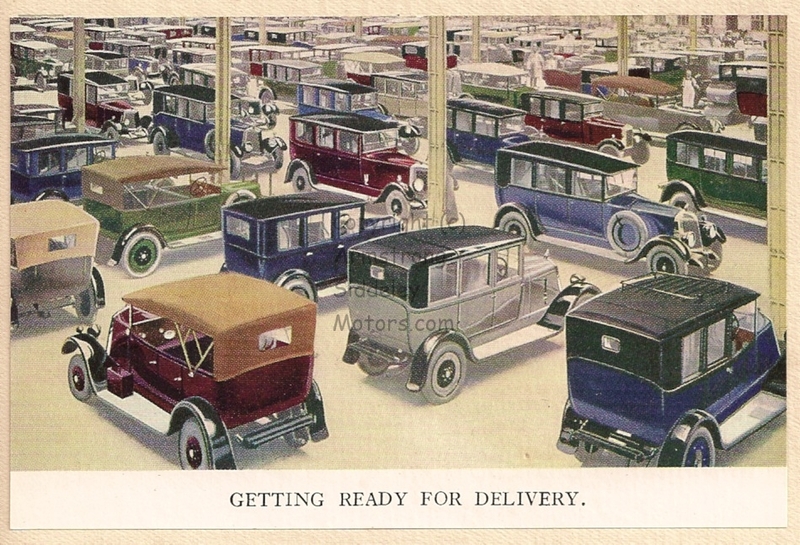 The works of Armstrong Siddeley Motors, Ltd., at Parkside, Coventry, cover a ground area of 25 acres (approx 10.1 hectares), and have a permanent establishment of 3,000 people in continual employment. These two facts in themselves are sufficient to warrant one in painting a word-picture of their activities with a light impressionist brush. A detailed account of so large an enterprise would bore any reader. Wander, therefore, through the great shops and certain definite appreciations will come to the surface of your mind through the welter of a thousand details and remain. At the end of a long clanging, machine-whirring day, when you have glanced casually in passing at the face of this man at his machine-tool, that boy at his bench; or stopped and heard the long explanation of a foreman or examiner as to why this, that, and the other is done, you will ask yourself, probably: “What is my outstanding impression? There is something what?” And the answer comes sliding into the mind immediately – one word – CONFIDENCE . . . Yes, that is it. That is the over-riding feature of it all confidence. You have asked a hundred questions. You have, maybe, laid a few simple traps to confuse the voluble, or to stem the flood of enthusiastic oratory of this guide or that. It is of no avail. Every man in those enormous buildings at Coventry, no matter how insignificant his job, how great his responsibility, seems quietly confident in the knowledge that he is working with the best tools on the best material to the best possible end. At a baize-topped table sits a man making up a set of gauges; and the gauges rule this factory. A simple enough operation when you see him doing it. But you are told that all these hundred and one gauges are checked over with meticulous care once a week to avoid the possibility of any discrepancy in infinitesimal measurement being caused by wear or otherwise. And the measurement is to infinity almost; at least you find it difficult to grasp any manufacturing significance in a ten-thousandth part of an inch. But these gauges fit, when necessary, to as minute a fraction as that. And, as they will tell you, upon the accuracy of a gauge hangs the right and wrong of most matters. A gauge to an engineering shop is as a needle to a mariner’s compass; by them the steel ships are steered into the true -making or the false. A tester of gauges is a man bereft of illusions. You cannot retain any illusions when you concentrate your attention for hours a day upon – tens of thousandths of an inch. The layman’s mind boggles at such a fraction. But the mind of the gauge-tester wanders in an arithmetical ether of his own-beyond our vision or our ken. They describe them at Coventry, laconically, as the Lower, the Middle, and the Top Shop. And that’s that. To you they are something quite different. A thick copse of shafting and belting in which move masses of blue-clad men about the roots of the trees, which are the machine-tools at work. Hundreds upon hundreds of these there appear to be, all whirling comparatively silently, some of them entirely unattended, and all of them with an accuracy and deadly precision which is almost uncanny. There is a machine, for example, which makes its own set screws without man’s interference, all by itself. A perfectly ordinary tool, driven by power; and familiar to the point of contempt to all engineers. But when you gaze upon its relentlessly accurate functions you realise what a degree of perfection modern machine-tool methods have reached. You proceed from machine to obdurate machine amid the roar of production, and the thirteen hundred men attending them hardly notice your presence at their elbows. There seems nothing-the machines cannot do. Each one is a law unto itself. But it has got to be cared for properly, given steel to eat, and much milk-white oil to drink, or it knocks off work. And if a machine-tool goes on strike, by just so much activity is the inexorable pendulum flicked back on the dial of daily output. And that won’t do. Hence the watchful men at their sides, feeding, adjusting, levering, shutting off, turning on, tirelessly attendant always. It is while absorbing the multifarious processes of the machine-tool shops that the beneficial effect of aero-engine production upon motor-car manufacture is brought home to you. A firm like this, which is building aeroplane engines simultaneously with motor-car engines, has built aero-engines for the Government continuously since 1915, has an immense advantage, both to itself and its customers, over the firm that is building motorcar engines only, and has never built anything else. Great engineering skill and ability is vital to the production of a modern aeroplane engine. The lives of men may hang upon a thread of inaccuracy, upon a moment’s inattention in construction. No need to labour this point, it is obvious. Furthermore, the rapid development of belligerent aeronautics, in speed, altitude, and general air-worthiness under heavy load and fighting stress, has brought about a standard of manufacture so high that only the fittest to build have survived. Consequently the highest grade of skilled workmen only are employed upon these labours. Aero-engine manufacture is carried out to much finer “limits” than any other form of engine production. The continual testing, examining, and rejecting is of the most stringent and inexorable kind. Such men are employed in large numbers throughout the Armstrong Siddeley works. What is the result? The result is that this fine-limit work, as it is called, this meticulous precision of craftsmanship, percolates throughout the factory. It is bound to be so. Aero-engine production, by the very gravity of the responsibility entailed, is the paramount influence; the psychology of contact and environment does the rest, and the motor-car engine production is benefited to a marked extent because of it. The Siddeley aero-engine during the war held a high place in aeronautical records, as everyone knows. The Siddeley Works (as they were then) actually produced during the war period upwards of 1,500 aeroplanes. They are now engaged upon the steady production of the Armstrong Whitworth Siskin Fighting Scout, driven by their wonderful “Jaguar” radial engine. As to the recent performances of this Royal Air Force weapon, one must not, in the public interest, enlarge beyond saying that they are remarkable, and-comforting! One pauses for some time in that part of the machine shop where the seventeen operations are performed upon the crankshaft before it is passed out for assembly into the chassis. The functions of a crankshaft need no explanation. Its interest lies in its shape. When you look at the photograph and realise that the finished article is fashioned from one piece, one block of steel, you will appreciate the intricacies of its manufacture. And yet so absolutely accurately does it come through its seventeen phases of production that, at the end, it can pass the final test at the hands of a merciless man whose great and abiding horror in life is engine vibration. If the crankshaft, after passing through all its processes of manufacture, has not been filed down, cut, shaped, and polished in such a manner that its weight is distributed absolutely equally over all its length, vibration will eventually ensue when the crankshaft is at work in the car. Wherefore this man lays the two ends of the shaft in sockets and lets it swing round on its own momentum. Its weight is twenty pounds. It has got to stop and remain still at just whatever angle he may choose. And a half-ounce wad of Plasticine stuck upon it has got to be sufficient to create bias one way or the other. It is called the Plasticine test. There is nothing much wrong with a crankshaft that gets through this examination successfully. The crank case of an Armstrong Siddeley car goes through twenty-eight different operations before it becomes a finished and approved article. That is onerous enough for it in all conscience, you think. And then you see the master ring for the radial aero-engine, and when you hear that this one part has thirty-six separate and delicate operations performed upon it before it is completed, and that it takes exactly one month going through the shops from start to finish, you begin to understand why aeroplanes and their engines are such expensive luxuries. No part of an Armstrong Siddeley car or an aero-engine can arrive at its finished state ready for work until it has passed through the hands of a series of inexorable people whose purpose in life is to find fault. There is quite an army of such inquisitors at Coventry. Material of whatever species, though this form of what one may call Custom House searching applies more forcibly to metal parts than to others, is first of all minutely examined in the rough. As it goes through its varying stages of evolution it is continually pounced upon by tight-lipped men called “shop inspectors.” In the case of aero-engine parts, or any component part of an aeroplane in the making, there is the ever-present A.I.D. or Government Aeronautical Inspection Department. ..They have telescopic eyes for faults, these men; and you can take it as an axiom of faith that if the A.I.D. stamp is on a part it is so. That part is the alpha and omega of correctitude to Government specification. So what need have we of any further witness? At this stage of one’s examinations of the functions and fulfilments of examiners, one is reminded whimsically of the old song about “the biglfleas have littlefleas upon their backs to bite ’em; and little fleas have lesser fleas-and so, ad infinitum!” Because, glancing up the scale of the examiners’ caste, when you think you have studied them all, you find yet another tribe, sitting apart, majestic, terribly official. These are the chief inspectors-the overlords of all the others. The examiners of examiners. It were easier for a 5-ton lorry to garage itself in the scullery of a semi-detached villa than for a defective unit of an Armstrong Siddeley car to enter its chassis through these shops. It was here, in the works of the Burlington Carriage Co. – a separate but Subsidiary organisation, whose premises adjoin those of the parent concern- that I found my guide falling for the first time into eulogy. Hitherto his admiration had been curbed by custom. But here, when he saw my uncontrolled amazement, he replied merely: “Yes, it is the finest in the country, and one of the largest.” This statement, I believe, is not open to contention; it is an accepted fact. Here one sees an army corps of men working to the dirge and drone of the saws and planes on vast quantities of English ash and oak – no foreign wood is allowed in here. They will show you how the framework of your car body is gradually assembled. How the forty-two operations take place on the rear corner pillar before it is ready to go on the body. Every joint is splashed with white lead paint before fitting home; no damp can get at those hidden joints thereafter. Everything fits into jigs. The system of building up by jigs on a large scale such as this is interesting, in as much as there is no possibility of error in construction. A jig is a master pattern. It permits of no deviation by a hair’s breadth. The thing that goes into it has got to fit – or it won’t go in. Hence you have an immense saving of men’s labour fitting by hand, with a margin of human error always probable. Whereas a jig is fool-proof. The building of car bodies on a very elaborate system of jigs lowers the ultimate cost to the owner. True, he has got to have a standard body; but there are twenty different types to choose from. Eventually you see these enormous boxes of bricks, these jig-saw puzzles, dropping faultlessly into their allotted places, and the body then goes to be painted. Few people, I imagine, are aware of the numbers of coats of paint and dressings a car body endures before it appears in its glazed glory in your garage. Its period of immersion in the paint shops is a long one. When it leaves the hands of the body-makers and arrives, naked and unashamed, in the presence of the painters, their first action is to clothe it hastily in a coat of lead colour. This is a crude covering, but modesty is for the moment assuaged. Then its under-garments are put on in the matter of six coats of filling, one after the other. Through these peep here and there the red lead. So a platoon of men surround the body and it is thoroughly rubbed down all over until the red lead vanishes. Where any red appears it signifies an irregularity of surface, however minute, hence the hefty rubbing. Next, a light overcoat of grey facing matter is superimposed. After which, men go over every crevice, putting in stopping round all edges – a full day’s labour. Then it is “faced over” with a fine brick to get smoothness. A smoothness as of a baby’s cheek must be obtained before any colour can be applied permanently. Now comes the paint. Four coats of colour, applied carefully, is the minimum. Next, a coat of hard-drying varnish. Again the rubbing-down process all over with cuttle fish and pumice-stone to eliminate paint “clots.” Yet another coat of hard-drying varnish after this before she goes to be upholstered. Then back she comes again, to be finally invested with a last garment of hard-drying varnish. This last adornment is very de luxe work, it being carried out in isolated rooms, specially constructed so that they are absolutely dustproof. And now, at length, she is as you see her glittering in the showroom. This exacting treatment does not apply to all colours of paint varnish. Some require even more processes than this. But normally this is the system. There is, of course, an alternative to these arduous and prolonged manual labours with a brush. It is known as “spraying.” A simple expedient, an American invention, whereby a man points an instrument not unlike a revolver at the body, through the muzzle of which a fine jet of paint is sprayed on to the woodwork. Being nothing if not conservative in our ideas there are some people who condemn this method as “slap-dash,” affirming that only the man and the paint brush can really do the job properly. An exploded theory, as is self-evident if you watch an expert sprayer at work. In the latter case you get complete uniformity of surface, economy in material used, and, from a point of view of labour-saving it is interesting to note that while an average sized motor-car body takes a skilled painter four hours to go over it with a brush, the sprayer does the job in exactly half an hour. To all intents and purposes the result is the same. Only a painting expert can tell if a body has been sprayed or hand-painted; and the durability is the same either way. In the upholstery department you see the helpless body of the car squatting on low trestles, being padded and cushioned for the sybarites who will lounge in its interior. You can choose your cloth and colour. All wool, or real buffalo hide leather. All cloth used is lined first with wadding and calico before being stuffed with the best horsehair, to prevent horsehair ends protruding through the coverings and tickling the back of your neck. Underneath all that are the Buoyant springs, the “springs sprung on springs,” so familiar by advertisement. It is here that the silk-smooth interiors of the Pullman and Saloon bodies are deftly fashioned. Here that all the little wads and recesses of comfort and extreme luxury are applied, and the knick-knacks and internal accessories added. Here women sew and cut and sew again; and men with nails in their mouths hammer and stretch and adjust the-fine fabric and the silk braiding. Here that the silk window curtains are run in, the wrist flaps hung, the soft carpets measured into place, the car adorned internally with the care and minute attention to detail and good taste that is branded on the Armstrong Siddeley the world over. Investigation and a careful study of their works produce a portentous array of witnesses for the defence of this argument. Curtailed to the extreme of brevity, and taking only the more emphatic witnesses, they are as follows:- There is first a remarkable list of eminent owners of Armstrong Siddeley cars, headed by H.R.H. the Duke of York, K.G. It is a fair presumption to suppose that none of these notabilities walked vaguely into the first showroom they saw and said: “I like the look of that car; put it down to my account and send it home.” One may reasonably assume that they were propelled towards the purchase of an Armstrong Siddeley by expert and unbiased advice, after the whole car market had been studied. The greater the celebrity the more readily is advice and assistance proffered from the four quarters of an envious world. There is secondly the significant fact that there are bought every week by the motoring world an average of sixty Armstrong Siddeley cars. The car has, of course, its critics upon the roads of England-critics who will quite probably decry this car to you, showing a marked disability to arouse enthusiasm about it, having a preference in other directions. That is all to the good, because competition is a healthy thing. But this record of steady output and sales must surely shake the critic considerably in his opinion. Two test journeys, totalling 25,000 miles-more than the entire distance round the world-in 57 days, by an I8-h.p. Open Touring Model, and a 30-h.P. Interior-drive Limousine, under R.A.C. official observation. Both cars, ordinary standard models, were run day and night continuously – 450 miles every twenty-four hours, Sundays excepted. The I8-h.p. completed 10,000 miles in 23 days and the 30-h.p. travelled 15,000 miles in 34 days. ,The fuel consumption of the I8-h.p. was at the rate of 24.64 miles per gallon. The oil consumed was only 6 pints-equal to 13,347 miles per gallon.In the test of the 30-h.P. model, fuel consumption was 21.2 miles per gallon, and the oil consumed was 21 gallons-equal to 6,667 miles per gallon. In both tests three people were carried throughout. These are facts, vouched for by ruling authority, which you cannot easily forget or ignore. Note: the book is not dated but all the evidence points to 1924. I hope I haven’t infringed copyright by putting this extract on the site. I own a 1924 Gräf & Stift, Austrian town car. It was supposedly bodied by Burlington. I am trying to find evidence of this fact. Was Burington Carriages engaged in bodying foreign car chassis? I am interested to hear about the 1924 Graf and Stift. I think it is unlikely that Burlington bodied foreign cars, but they might have done so. Armstrong Siddeley owned Burlington and the works were next to the where they made the cars in Parkside, Coventry. I am sorry to be very slow to reply. My car has the Burlington name plate on the body below each door.